Telangiectasias, commonly referred to as spider veins or broken capillaries, are small, nonfunctioning blood vessels that become dilated and, therefore, more visible under the skin or on mucous membranes anywhere on the body (face, neck, legs, arms, etc.). Isolated spider veins generally pose no health threat to patients, but are a common aesthetic concern. However, if a patient presents with more extensive or numerous spider veins, this may be indicative of a more serious vascular or medical concern. Therefore, spider veins should only be diagnosed and treated by an experienced practitioner under a physician’s supervision. What is Laser Spider Vein Removal? Among the various treatment methods available to treat spider veins (surgery, ablation, phlebectomy, sclerotherapy, laser, etc. ), laser therapy is the optimal solution to treat smaller, isolated dysfunctional vessels that do not warrant more aggressive treatment. Dr. Seiler believes that, although the ND:YAG is the best laser to treat these vessels effectively, it is sometimes necessary to use other technologies, including IPL (Intense Pulsed Light) Therapy and RF (Radio Frequency) Therapy. Why is Laser Spider Vein Removal different at Seiler Skin? At Seiler Skin, we are able to combine the use of numerous treatment modalities (laser, IPL and RF) to ensure optimal outcomes for our patients. The ND:YAG is one of the most powerful and efficient lasers on the market, and requires extensive knowledge and experience to safely and effectively use. 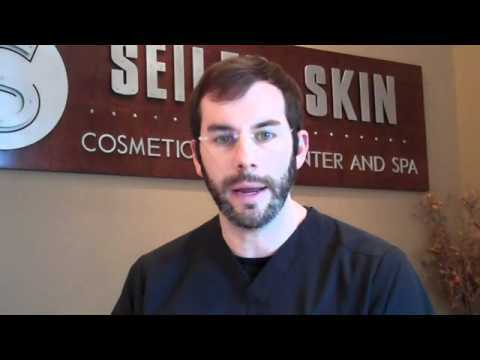 Dr. Seiler is extremely well-trained and versed in the use of the ND:YAG and other lasers. Due to the possibility of underlying vascular disease, it is critical that the provider you choose be capable of recognizing the need for further vascular evaluation before simply treating the visible spider veins. If a patient’s condition is more extensive, Dr. Seiler will discuss the need for a specialty vascular consultation before treatment. What are the results of Laser Spider Vein Removal? Patients can expect near to complete resolution of their spider veins through laser therapy. Depending on the severity or complexity of a patient’s vascular issue(s), one or more treatments may be required to completely remove spider veins. Generally, one to two treatments provides impressive resolution. Because spider veins are resolved through heating and damaging the inside of the vessel, resolution depends on how quickly and completely the body reabsorbs the inactive vessel. This process typically takes several months. What is the downtime after Laser Spider Vein Removal? Small, isolated vessels often disappear instantly. More extensive vessel formations may show mild bruising after treatment. Dr. Seiler will discuss the likelihood of bruising with you before your treatment so that you know exactly what to expect. Is Laser Spider Vein Removal painful? Laser Spider Vein Removal has a reputation for sometimes being a painful procedure (largely dependent upon the concern treated and patient’s level of tolerance). Although patients generally tolerate this treatment well, for sensitive patients, the discomfort of this procedure can be minimized at Seiler Skin thanks to our Pro-Nox device. This nitrous-oxide device produces a mild sedative effect, similar to the “the gas” at a dentist’s office, which is quickly metabolized and out of your system within minutes. Pro-Nox is a game-changer, and produces no lasting effects – you can drive home immediately after your treatment. Is Laser Spider Vein Removal safe? Yes, Laser Spider Vein Removal is safe when performed by a laser expert. Remember – the ND:YAG is a very powerful device that, if misused, can cause complications. It is important that patients educate themselves and choose an experienced provider.